by Kathryn.In analysis.2 Comments on The return of thrift? It’s a book that invites the reader to envisage a world in which the concept of waste does not exist, and where re-use is preferred to recycling; in short, a world where products have a true life-cycle, rather than a passage from cradle-to-grave. This way of thinking used to be summarised as ‘thrift’ (defn: careful and diligent in the use of resources) and reminded me of several articles I’ve read recently querying whether thrift was making a come back – as exemplified by this Telegraph article. I decided to see if Google Trends data backed up this notion. As you can see the blue line graphing the word ‘thrift’, is fairly stable, the lines displaying the search frequencies for ‘recycling’ and, more interestingly, the word ‘re-use’ have increased, but not that dramatically. But take a look at the lower graph. 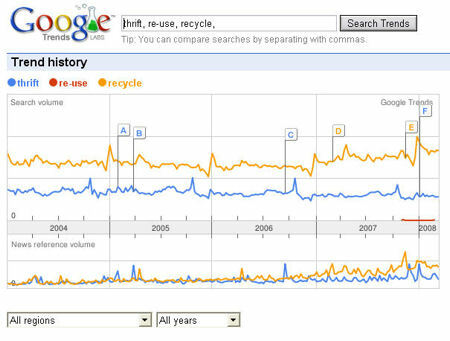 It displays the frequency of the topics appearing in news items, and there you’ll see a distinct upward trend for both the terms ‘thrift’ and ‘re-cycle’, although the term ‘re-cycle’ is increasing more rapidly. Unfortunately, as the data set is not large enough to display regional differences we cannot come to any definite conclusions, but if the vision of Cradle to Cradle is to be realised it would appear that there is much work to be done. I didnt make your blogroll! Love the theme…I may steal it. You did indeed tell me some time ago… it’s just taken me a wee while to get around to putting something together. Glad you like the work of Mr Eastaugh and Sternal-Johnson, all credit to them I say. Oh, and I’ll see what I can do re. the blog roll.